If you’ve been following me on Instagram or Facebook you’ll have spotted me working with this amazing hand dyed yarn. Of course it is one of those skeins that I fell in love with and had to buy even though I didn’t *technically* need more yarn. I do love colour and so variegated yarns are often very appealing. 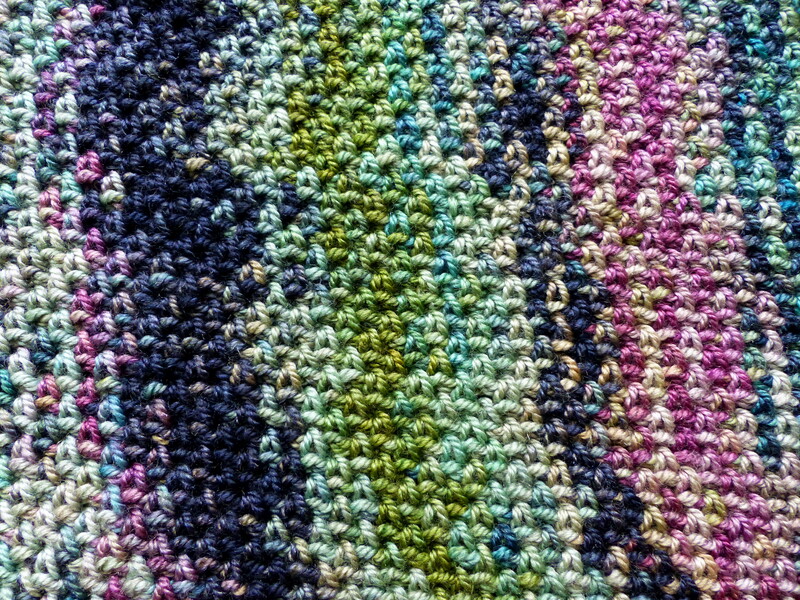 However, I think that sometimes short colour changes and vivid colours lose a lot of impact when used in crochet. More thoughts on handling this on my blog about colour here. Anyway, this cowl is part inspired by the knitted pattern Pool & Conquer which I spotted on Ravelry, and part by my Linen Stitch cowls. 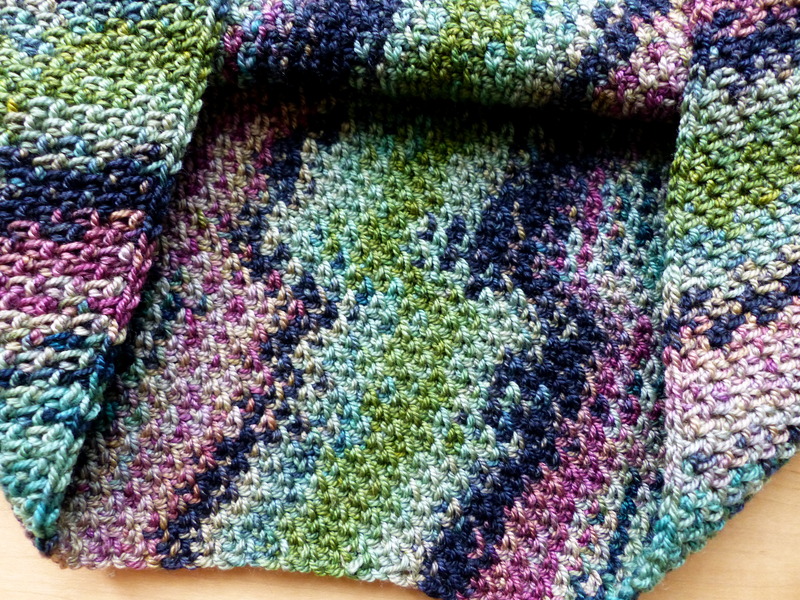 The colour pooling element really appeals as a way of keeping the impact of the colours rather than blending them – and this cowl is designed to work for any repeating variegated yarn. The linen stitch is simple and uses less yarn per stitch than most patterns, which is why I chose it – plus I love the stretchy, smooth texture of the resulting fabric. 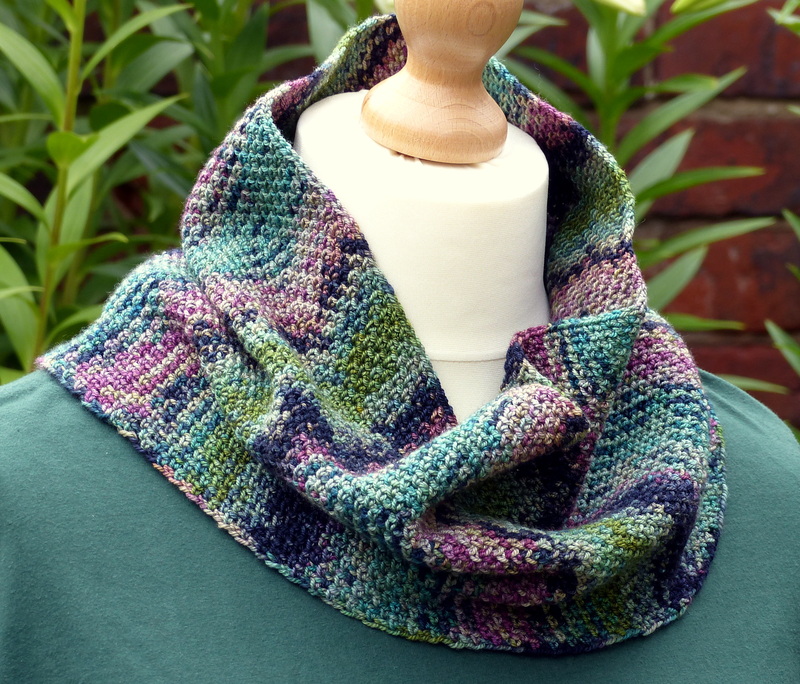 This pattern is really more of a recipe than a pattern because it relies on your selected yarn to form the wavy vertical stripes up the work; it is written so that you can use any repeating variegated yarn, even with short variegations! Colour Pool Cowl – Free Crochet Pattern from Make My Day Creative specifically for short colour variegated yarn. This is the stitch pattern from the inside. You can substitute any variegated yarn you choose as long as it has a colour repeat – you will need about 100g for a simple cowl, and more like 300g for an infinity scarf to be worn doubled up. Go up a hook size from what is stated on the ball band, for extra drape. Before you begin, familiarise yourself with how the colours repeat in your yarn. If your yarn is in skeins from the dye stage, do this before you wind it into balls! The easiest way to spot the repeat is to look for an accent colour – in the example, I looked for the purple sections and found I had two purple sections in each repeat, and the repeat was about 160cm long. Next decide how many repeats you want going around your cowl. I needed two for a cowl large enough to go around my head – obviously you’ll need more for an infinity scarf version to double wrap. Either: Measure out the number of repeats you are using and cut off a length of yarn that long (or a bit shorter if you are making a longer infinity cowl). Alternately, begin with both the centre pull of the yarn and the outer end of the yarn. Foundation Chain: Begin with the short piece of yarn (or the end you don’t want to work form for the majority of the project) and make a chain which is a bit bigger than your desired length of cowl. Do not fasten off, place a locking stitch marker in the end of the chain to prevent it from unravelling (you can also extend the chain further during Round 1 if you have not made enough). You will have a left over chain hanging from the work. Remove the st marker and place it into the loop on the main yarn so it can’t unravel. Carefully pull out the spare chains until there is just one chain after the last ch worked. Insert hook and sl-st to join the foundation chain into the first chain so that the foundation round is secured. Trim or cut the end leaving a tail for weaving in. Remaining Rounds: Remove the st-marker and insert hook into the main loop. *Ch1, sc into the next ch-sp, repeat from * around, working in a spiral (there is no need to mark the start of the rounds). Keep an eye on how the stripes are developing and adjust your gauge as you go if needed to keep them lined up – wiggles look good but don’t let them drift too much! Keep working in pattern until the yarn is used up or the cowl is your desired size. Finish with a ch1, sc into next ch-sp to fasten off. I’d love to see how your stripes have turned out so please share a picture over on Ravelry or Instagram! Clever the way you get the colours to stack up.